The Eye on Fire is the moving testament of a poet confronting the passing years and yet affirming the value of poetry, love and freedom. Chilean-Canadian poet Ludwig Zeller combines eroticism and spirituality in poems where reality shines with the light of mystery and imagination. The Eye on Fire is both lyrical and modern in the tradition of Rimbaud, Mallarmé, Eliot, and Holan. Translated from the Spanish by esteemed poet A.F. Moritz, this new collection from Zeller will find a place in the valued editions of contemporary world literature.With Spanish and English poems en face, The Eye on Fire offers readers the opportunity to engage in a poetry experience that transcends cultural and perceptual boundaries. Ludwig Zeller has been called the heir to André Breton. Born in 1927, in northern Chile, Zeller moved to Toronto at the time of the collapse of Salvador Allende’s government, and currently resides in Oaxaca, México. 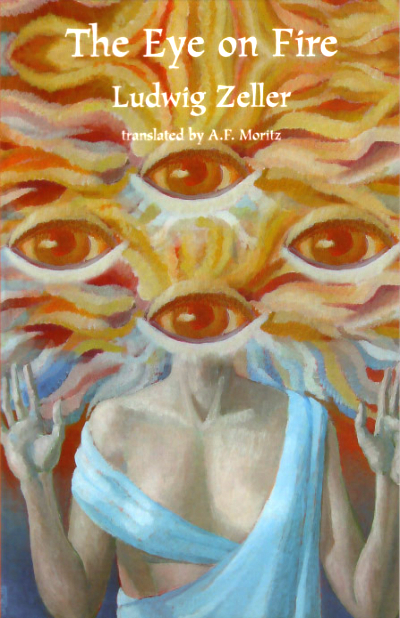 An internationally recognized poet and surrealist artist, Zeller published his epic Woman in Dream in a unique trilingual edition by Ekstasis Editions, with Spanish-English translation by A.F. Moritz and French-English translation by Jean-Paul Bedard.